New Delhi-based Soundworks, Audica Professional’s Key Installation Partner in India, has recently completed the installation of an Audica Professional sound system for Affinity. 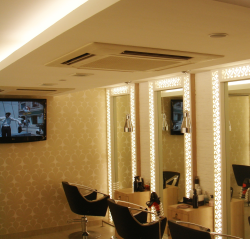 Affinity is an upmarket hair salon, located at the PVR Community Center complex in Saket, New Delhi. The system comprises of a MICROzone amplifier/controller, driving eight MICROdot ceiling loudspeakers. A single MICROsub extends the low frequency to give well-balanced hi-fi quality throughout the premises. Preet Singh of Soundworks commented, “Affinity wanted even coverage and the audio quality to create a very relaxing atmosphere. This system provides exactly that and the client is very happy with the results”. “The tiny MICROdots are very discrete and their extended frequency response and wide dispersion are ideal for this type of application. 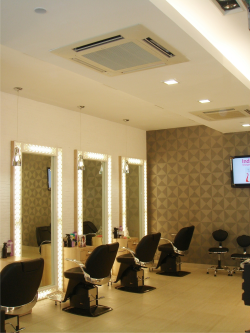 They also maintain their audio quality at much lower levels than larger systems; important when the staff and customers want a background music level that still allows them to hold a normal conversation. Bringing the sub in at 80Hz is also really useful in that it allows much greater freedom of system design without customers being aware of its location”.